These nutrition-packed cookies are referred to as lactation cookies because they help nursing mothers produce milk, but they can be eaten by anyone! Made two ways, there is a gluten-free recipe with peanut butter as well as an easily customized flour cookie. 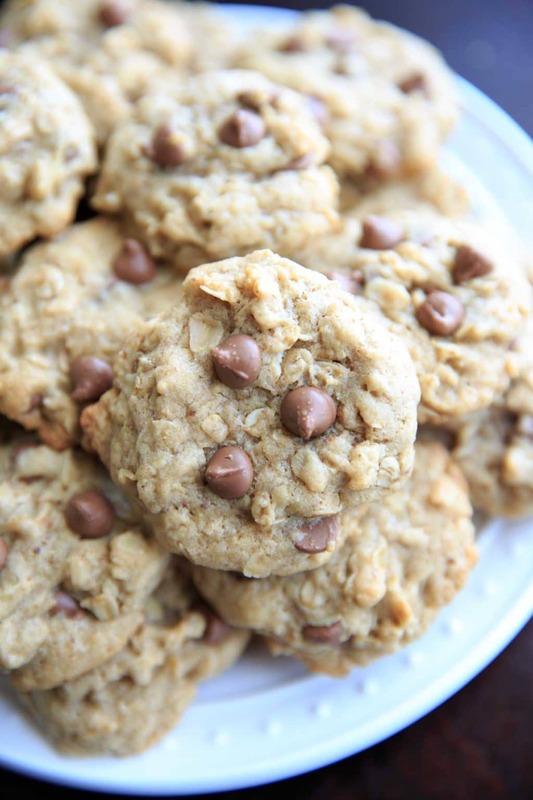 Click here to save this lactation cookie recipe on Pinterest! Let me start out by saying, to all my friends and family reading, to please not be thrown off by the title of this recipe. I am not lactating, nor have any need to lactate at this time. This is not meant to be a hint of any kind. 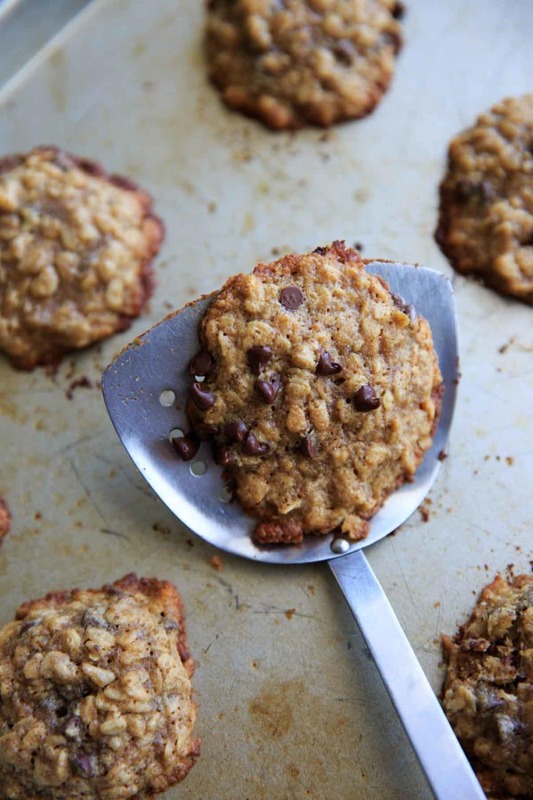 The only real difference between lactation cookies and regular cookies is the addition of a few ingredients, namely: brewers yeast, flax meal and oats. You can read about some of the health benefits of brewers yeast here. In true “trial and eater” fashion I immediately tried three different variations of this cookie. What I’ll end up sharing with you today is a base model cookie that you can adjust to your preferences if you like, and then a peanut butter oatmeal cookie that is gluten-free. Both of mine have chocolate chips, obviously. This is not a typical “lets reduce the sugar or fat in this recipe” here because new moms NEED the calories. Since oats are one of the main ingredients, it isn’t hard to make these gluten-free by subbing more of the oats for the flour. 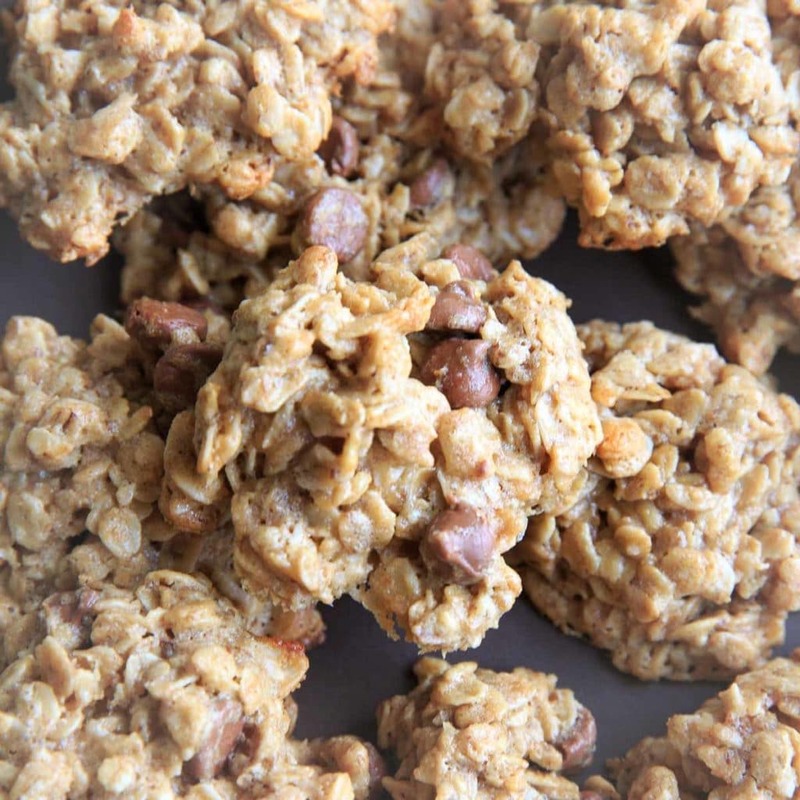 Though they can end up being a bit crumbly if they have too many oats (and not enough liquid binding them together), and a bit crispier if they have fewer oats. Use this knowledge to customize to your favorite cookie consistency! I preferred the “base” recipe with flour but my friend Lauren prefers the peanut butter + oats combo. Originally I was afraid that they would taste weird with the brewers yeast. Brewers yeast is essentially a by-product of brewing beer, and since I had never eaten it myself I was a tad skeptical. But in all honesty it took quite a bit of it for me to even notice the taste at all! With each batch I baked, I added a little bit more and a little bit more to test the limits. Everybody’s taste buds will be a little different, so you probably want to start small if you’re unsure. Mommas have enough to worry about – making food for their babies shouldn’t be one of them. 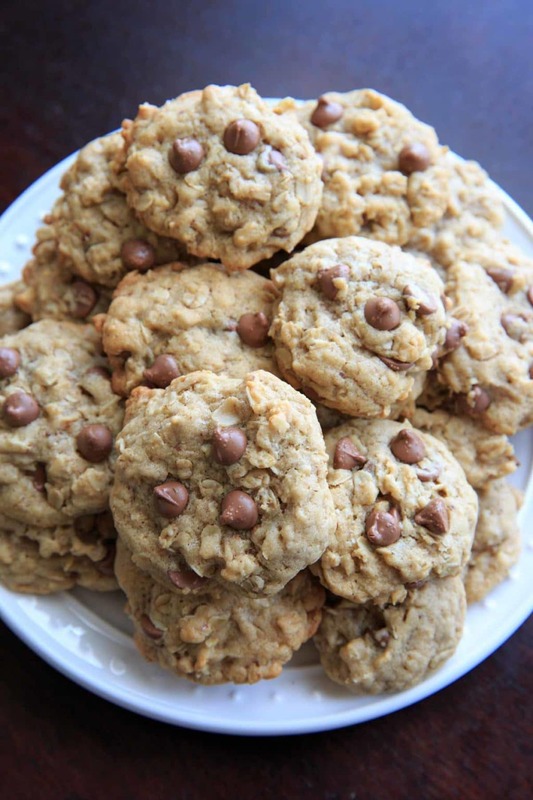 If you have a friend who could use some of these cookies, make them a batch! I’ll repeat: I am not lactating and I still ate and enjoyed these cookies. So you can keep some of the batch for yourself regardless. Also: Never in my life did I think I’d say or type “lactating” that many times in a row. These nutrition-packed cookies are referred to as lactation cookies because they help nursing mothers produce milk, but can be eaten by anyone! See notes for the gluten-free oat version as well as optional mix-ins for customization. In a large bowl, beat together butter, sugar, brown sugar, vanilla and eggs. Add flax meal and brewers yeast and mix well. Add flour, baking soda and salt to butter mixture and stir until combined. Stir in rolled oats and chocolate chips. Place on greased cookie sheet and bake at 350°F for 11-12 minutes, or until lightly browned. Optional mix-in ideas for either version: nuts, nut butter, dried fruit, coconut flakes, chia seeds, peanut butter chips, or more chocolate chips. *I've also tried to replace half or more of the butter with coconut oil, with success. Note that the cookies will spread using the oil. 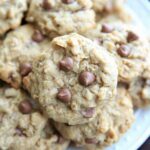 Do lactation cookies really work? Im 6 months pp. Now that my baby is eating foods now besides my breast. I’ve been pumping more everyday now (which I haven’t pumped at all in the last 3 months) I’ve seen quite a bit different recipes such as this. Before trying things like this. I’ve only been able to pump a max of 10ml per breast for an hour of pumping. 2oz in a 24 hour period. So I started having oatmeal for breakfast everyday and I can see a difference in my output being able to pump out maybe 25-35ml per breast for an hour of pumping now. I’m just curious to know if these lactation cookies will really help increase my supply?? There’s no guarantee of course but the Brewers Yeast and Flax seed meal have properties that can increase supply. I made these for a friend who said she believed they helped! Good luck! Can these be frozen? I’m making a batch today and wanted to give them to my friend for her baby shower too. They sound great! Thanks so much! They’re really good. I ate 1 cookie a couple of hours before baby bedtime and he had a huge feed! I’m hoping they can help me stock up for going back to work and also my friend who had low supply with her last baby. How many cookies per day are recommended? I’d recommend sticking with the regular recipe and not the gluten free one. I made the gluten free ones and while the flavor is good, the consistency leaves a lot to be desired. The gluten free ones definitely need some kind of GF to improve the consistency. I made these as gluten free but instead of replacing ther flour with additional oats u used a 1 to 1 corn free baking flour mix. They were fantastic. I also used coconut oil instead of butter. How long do these last ? Yum! I just made these! Although I can’t speak to their effect on my milk supply, I’m hopeful they will help. And, if nothing else, they’ll give me something yummy to enjoy in the name of lactation! I made them with 4 tablespoons of flax and 5 tablespoons of brewers yeast. I also reduced the white sugar to 3/4 cup and put in the 1/2 cup peanut butter. For flour, I did 1 cup of whole wheat white flour and 1 cup of oats that I blended into “oat flour” in my food processor. The more oats, the better, right? The consistency and flavor is perfect! Thank you for the recipe!